I am the Vicar of St Michael-in-the-Hamlet Church & Christ Church Linnet Lane (off Lark Lane). Originally from Cornwall, I studied environmental science and worked in the wholefood industry before becoming a church minister. I moved to Liverpool together with my family in 2010. 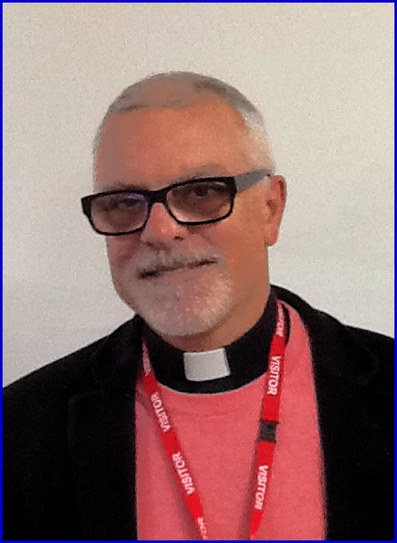 Before becoming Vicar at St Michael’s and Christ Church in 2016, I worked in the city centre as City Missioner, acting as a Chaplain to city businesses and institutions, including Merseyside Police. St Michael’s is a community centred, family friendly church. Many of our members have associations with St Michael’s School, past and present. We are a fully inclusive church, where absolutely everyone is welcome. Over the course of the year we put on a range of events, all of which are open to the community at large. My partner Maggie is an artist, art trainer, and mental health activist. We have two sons. In my spare time, I like listening to Jazz, walking our dog Joe and supporting West Ham United. It is a real honour to have been asked to become a Governor at St Michael-in-the-Hamlet School.